Step into the industry or expand your fleet with Boart Longyear Drill Rigs. Boart Longyear is the world’s leading provider of drilling services, drilling rigs, and performance tooling for mining and drilling companies globally. The company is 120 years old and maintains a reputation for producing some of the most dependable industrial equipment on the planet. 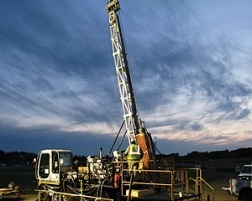 Rig Source’s partnership with Boart Longyear enables us to offer you the best drill rigs at the best prices. Below are a few of the models of Boart Longyear drill rigs we carry at Rig Source. The Boart Longyear LF70 surface coring drill is a valuable member to the Boart Longyear LF coring drills series with an innovative modular design that is lightweight enough to drill in the most remote locations. The Boart Longyear LF70 is a self-contained operator with a manual hydraulic system that is easy to operate and maintain. Since the Boart Longyear LF70 has such a simple hydraulic design it uses Direct-coupled hydraulic pumps with a PTO-driven auxiliary pump allow for easy maintenance. An axial piston primary pump and an axial piston auxiliary pump. When it comes to safety, the Boart Longyear LF70 uses the Nitro-Chuck system to power the spring jaws with nitrogen gas for the hydraulic open and close functions. Also, the Boart Longyear LF70 uses a rotation barrier that slows the rotation when the barrier is open to add protection to the operator. The Boart Longyear LF70 offers more than a dozen additional add-on options to get the most out of the core drill like hydraulic rod clamps, multi-language decals, water cooling for the hydraulics, and more. The Boart Longyear LF™90D surface coring drill is a valuable member to the Boart Longyear LF coring drills series with a telescopic and dump mast, taylor-made for truck or crawler carrier mounting. The Boart Longyear LF90D is a self-contained operator with the simple hydraulic system is easy to operate and maintain and lift-to-shift levers provide additional operator safety. Since the Boart Longyear LF90D has such a simple hydraulic design it uses direct-coupled hydraulic pumps with a PTO driven auxiliary pump allowing for easy access and maintenance. When it comes to safety, the Boart Longyear LF90D uses the Nitro-Chuck system to power the spring jaws with nitrogen gas for the hydraulic open and close functions. Also, the Boart Longyear LF90D uses a rotation barrier that slows the rotation when the barrier is open to add protection to the operator. The Boart Longyear LF90D offers more than a dozen additional add-on options to get the most out of the core drill like mud mixers, fluid circulation pumps, tool kits, and more. Simplify your search, and browse our supply of Boart Longyear equipment.